The city is abuzz with excitement over the best NYC events in October, but for many Gothamites, there’s nothing better than exploring our city’s fall foliage. 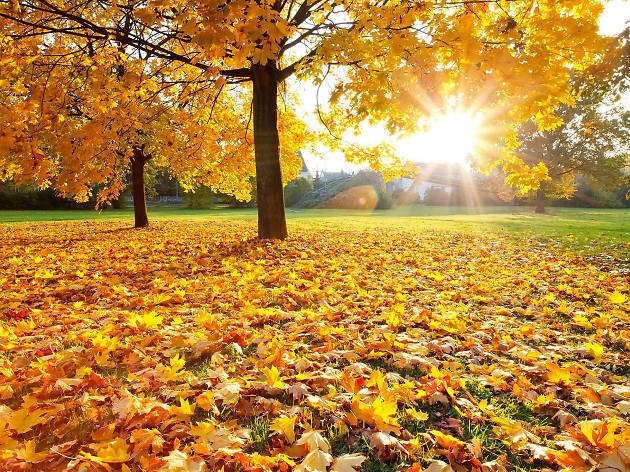 And, sure, experienced Gothamites know that the leaves start to change color earlier upstate—oh, how we love sniffing that fresh air during one of our fabulous fall getaways! 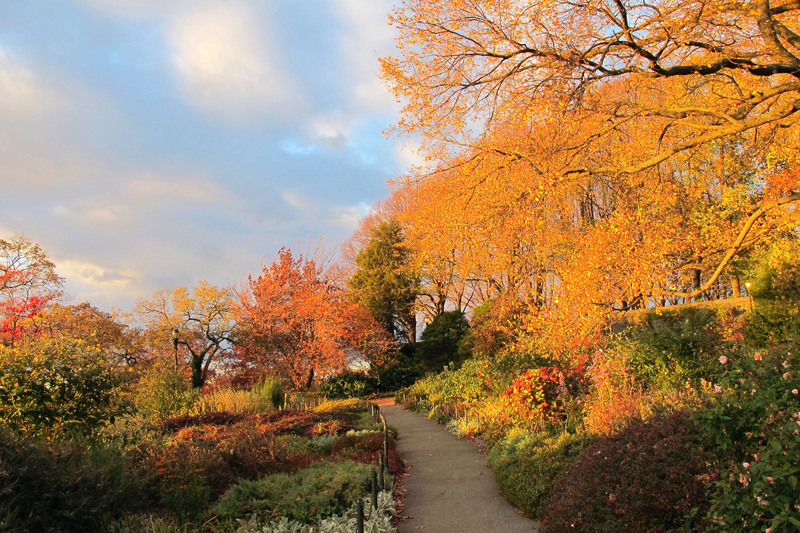 But if you’re patient, you can see some truly stunning fall foliage in many gardens and NYC parks in the city. 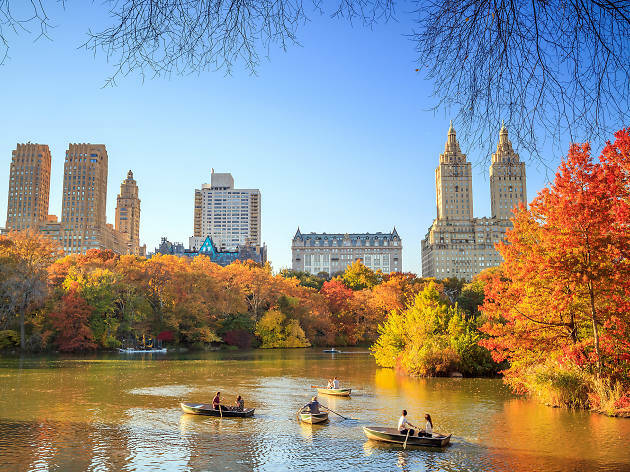 We've rounded up the top spots in NYC and New York state so you can certainly check leaf-peeping off your New York bucket list this year. Start at the Conservatory Water, near the entrance at Fifth Avenue and 72nd Street, where you can spot hawthorn trees covered in red berries. Then continue to the 38-acre Ramble in the middle of the park, where you'll find a large tupelo tree at the southern end of an area known as Tupelo Meadow; the leaves appear in various shades—red, yellow and purple—throughout the season. Continue your nature trek in the North Woods, a rustic landscape alongside the Ravine, featuring brooks, various oaks, elm, red maple and black cherry—enter at the eastern edge of the Pool (between 100th and 103rd Streets) and follow the trails north. 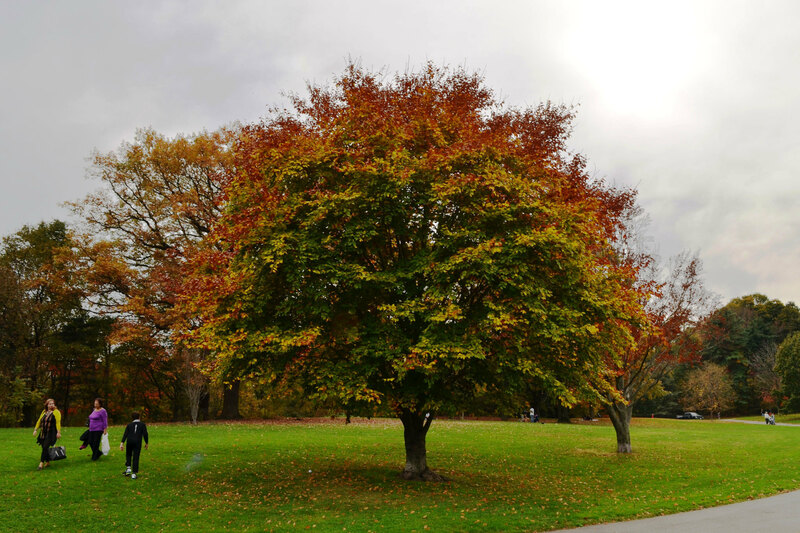 Near the Great Hill, look for European beech trees, which has leaves that turn a warm shade of orangey-red. Not feeling adventureous enough to wander through the park by yourself? 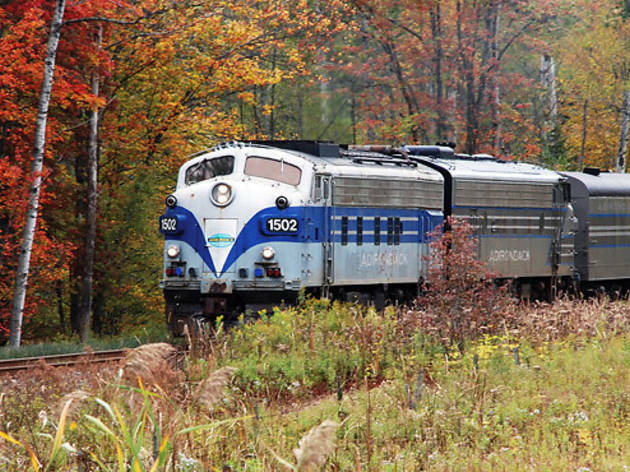 Book a private fall foliage tour, during which your guide will lead you to leaf-peeping paradise. 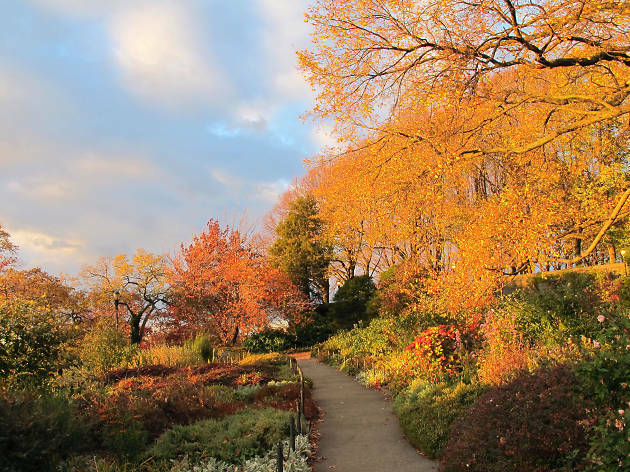 After a stroll into the Heather Garden’s vast swath of perennials and a walk through the Cloisters, hike through the arching trees and take a seat at the Linden Terrace, one of the highest points in Manhattan, where you’ll be able to gaze across the water at the Hudson River Palisades, which has 20 miles of cliffs that will be covered in vivid copper and orange foliage. Sugar and red maples—which you can spot around the park's lake—are the first trees to change, turning orange and red, respectively. The rest of the park's foliage should follow by late October, with species like elm, sour gum and sassafras all displaying fall colors. Head to the Ravine, a densely wooded area at the center of the park, for the highest concentration of plants. Seen enough trees? Climb the hill behind the Audubon Center; there you'll find a wildlife garden filled with plants such as holly shrubs, whose berries also transform in cooler weather. At just over a half-mile long, Tulip Tree Trail is a great place to spot this species. 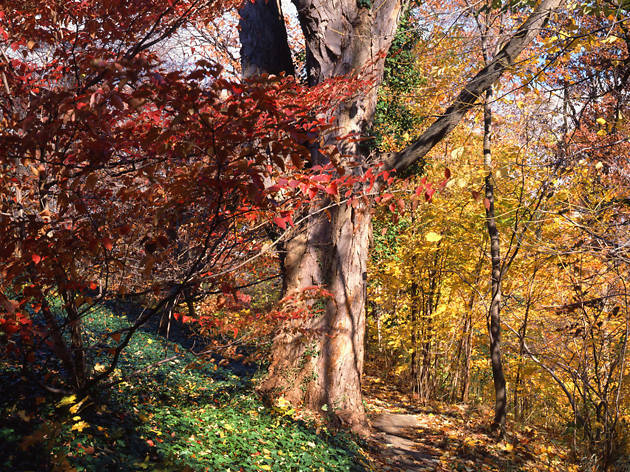 The park is home to what's purported to be the oldest and largest tulip poplar in the city (called the "Alley Pond Giant"), at a towering 133.8 feet tall. 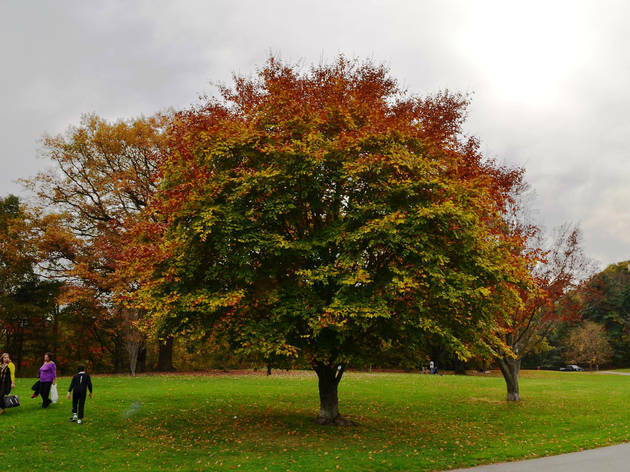 Other varieties that you'll spot within the Queens green space include white oak, red maple and sassafras trees, which turn yellow and red. 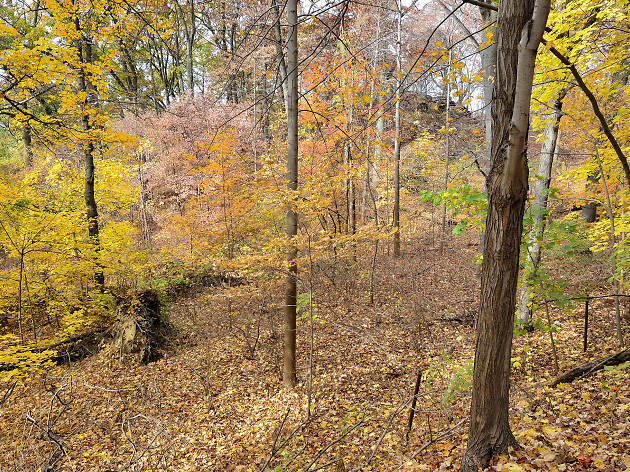 Consisting of 2,800 acres of interconnected open space in suburban Staten Island, the Greenbelt offers 35 miles of trails through parks and woodland. Start your expedition at the Nature Center, where you can pick up a copy of the trail map (which can also be downloaded from the website) and talk to naturalists. The eight-mile Yellow trail passes the ironically named Moses' Mountain, which was created from debris from Robert Moses's nixed plan to construct a highway through the area. 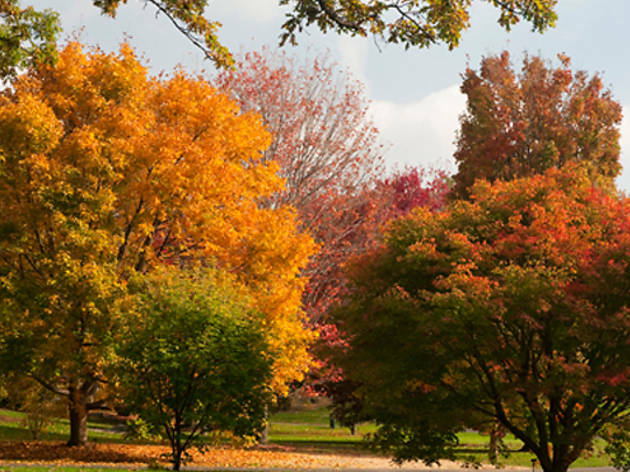 From the 260-foot hill, you get a panoramic view of the surrounding treetops—the mix of oaks, sweet gum, tulip, sassafras and red maple provide a blaze of autumnal color. On the other side of the mountain, cross Manor Road and head back into the woods toward the 90-acre High Rock Park, where you'll glimpse ponds and clusters of red maple. 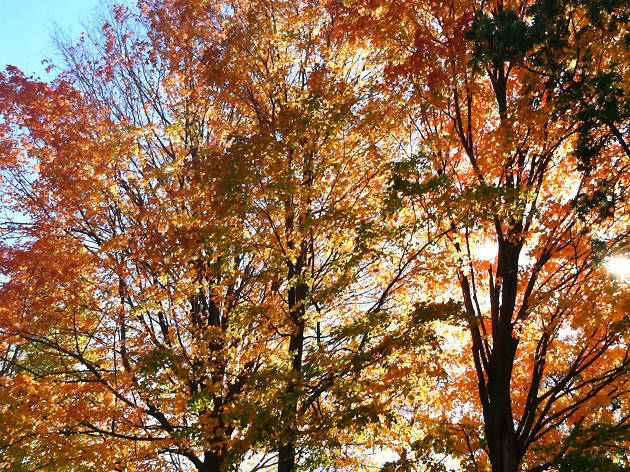 For the best leaf spotting, get lost in the garden's Thain Family Forest. 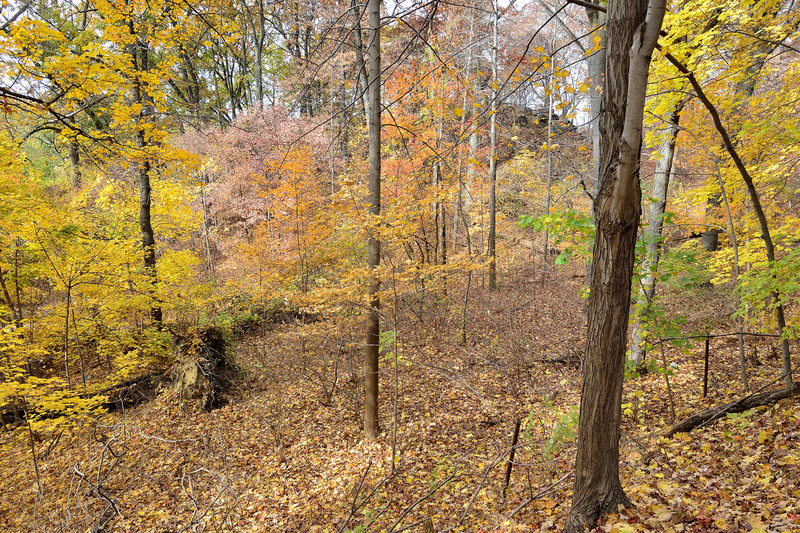 The 250-acre woodland area is the city's largest patch of old-growth forest (with some trees dating to the 19th century), and numerous species—including a high concentration of oak, red maple and tulip trees—can be found within the site. Keep an eye out for sweet gums, whose star-shaped leaves turn red and purple as autumn progresses, and scarlet oak trees, which are rich in tannins and display brilliant shades of orange and red. 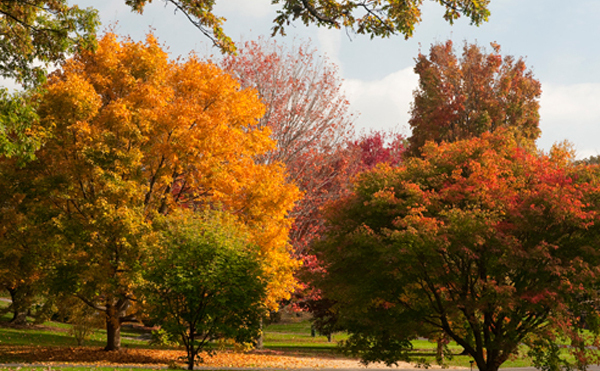 To learn more, head to the garden for two Fall Forest Weekends, which include guided foliage-themed tours, among other activities. 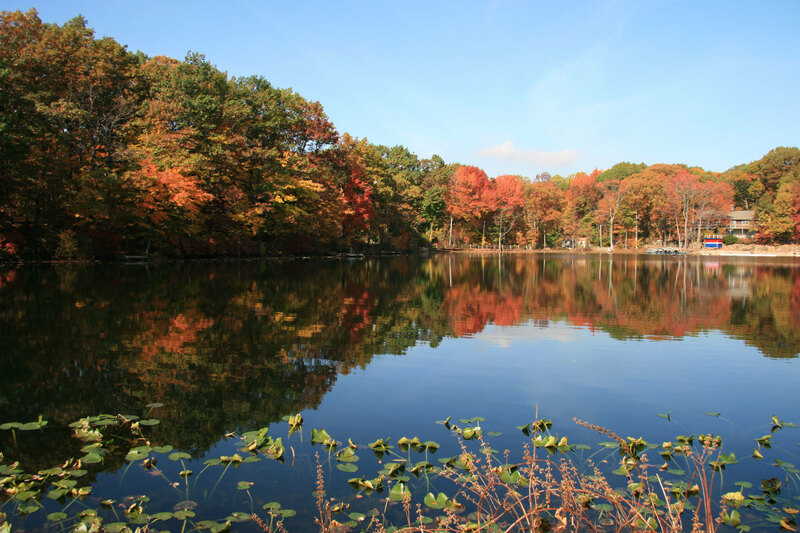 This 139-acre park features scores of verdant woodlands and a vast diversity of trees. 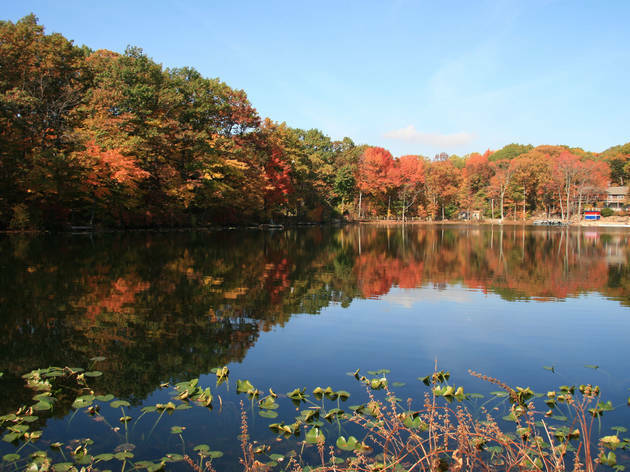 Occasionally, the park offers free fall foliage hikes, during which you can learn about how leaves change and to see the shifting palette of greens, browns and oranges in Staten Island’s dense, untouched woods. This enormous Bronx park can overwhelm, with more than 1,000 acres (and an estimated 80,000 trees) within its borders. 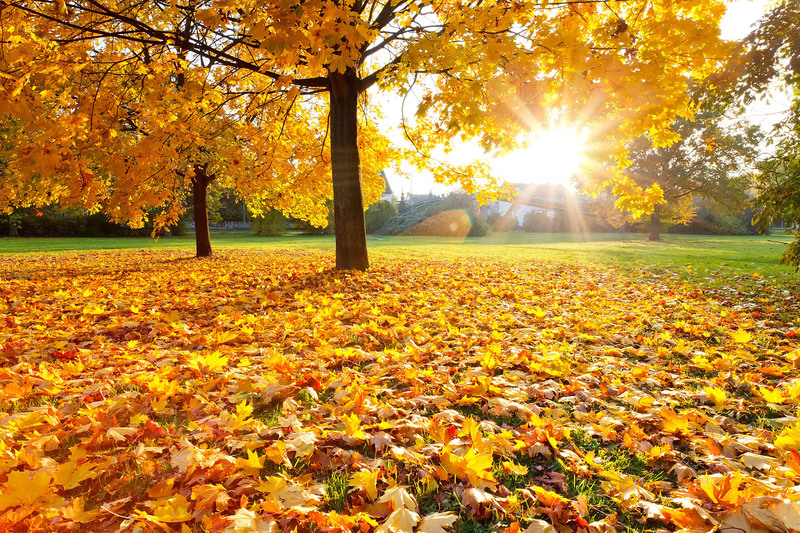 But that also makes it ideal for leaf peepers, who can see species such as oak, sweet gum and hickory displaying rust and orange leaves. For superlative views, take a stroll along the Old Croton Aqueduct Trail, a 1.1-mile nature walk built atop a former tunnel that shuttled water from the Croton Reservoir down to New York City. Check out tulip and maple trees in shades of goldenrod and scarlet. Vivid foliage is in evidence as soon as you enter the grounds of Wave Hill—look out for a golden larch south of the main entrance. It's best viewed from beneath its branches on a clear day when the sun shines through the gilded leaves, says horticultural interpreter Charles Day. 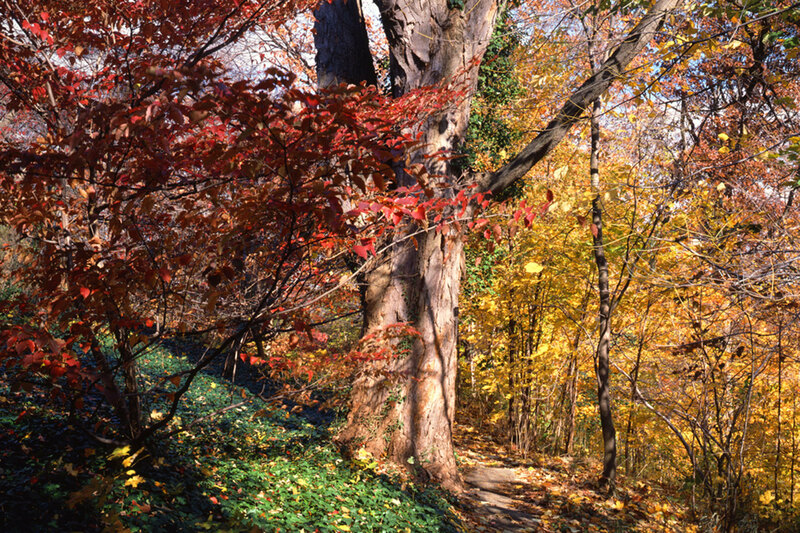 Take a seat in the open-sided structure to admire the fiery palette of the New Jersey Palisades on the other side of the Hudson—the pristine oak-hickory forest is scattered with maples, sweet and sour gums, black birch and tulip trees, resulting in an impressionist patchwork of rich hues. If you still crave more, venture into Wave Hill's eight-acre woodland to stroll amid sugar maple and hickory trees. 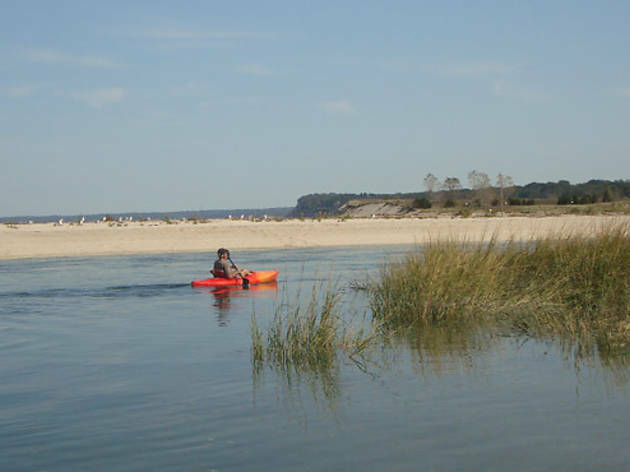 Though Long Island is better known as a summertime beach destination, there are plenty of reasons to head east after Labor Day. Sunken Meadow State Park (Rte 25A at Sunken Meadow Pkwy, Kings Park, NY; 631-269-4333, nysparks.com) is just 50 miles outside of the city, and offers dazzling views of Long Island Sound and even a slice of Connecticut in the distance. 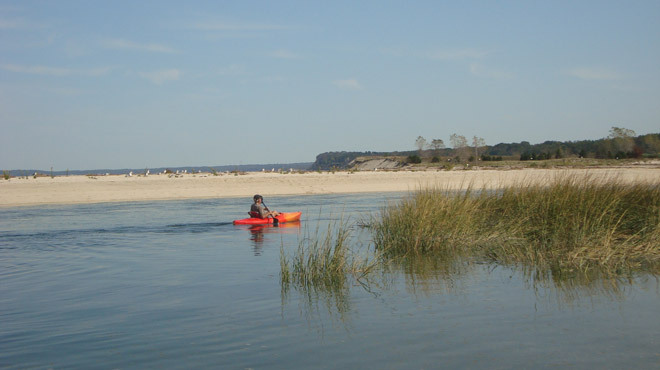 The park’s diverse topography allows you to view the seasonal changes in a variety of settings, from beachfront to bluff top. 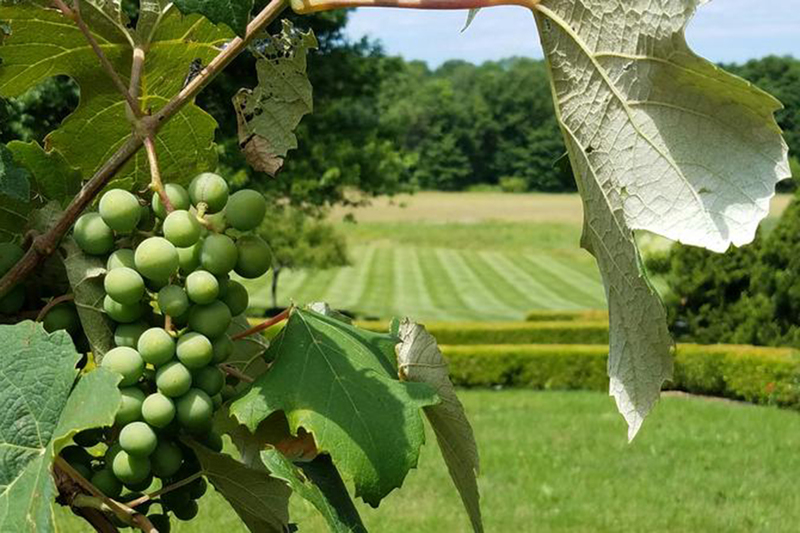 The fall harvest season is also a great time to make your way to Long Island Wine Country (liwines.com) to visit the tasting rooms of more than three dozen local wineries. Brought to beer lovers by Circle Line Sightseeing as an upgrade to the usual Dayliner route to Bear Mountain, the two-and-a-half hour Oktoberfest Cruise up the Hudson gives gorgeous views of New York's fall foliage through sightseeing windows while guests dine on classic German food and beer. All the staples are covered, with traditional Bavarian pretzels and choice of two plates: a Schaller & Weber bratwurst or thin-pounded pork schnitzel, both served with sauerkraut and warm potato salad. Diners can supplement the meal in the cafe, stocked with salads, sandwiches, snacks and a full bar serving beer, wine and cocktails. While aboard, German oom-pah and polka bands will serenade party cruisers on Saturdays and Sundays. 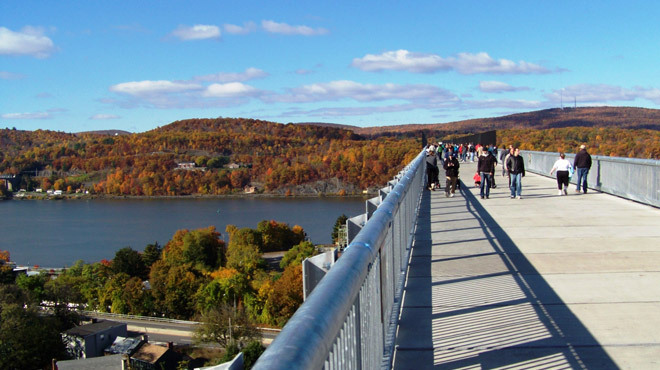 Think of Walkway Over the Hudson (87 Haviland Rd at Rte 9W, Highland, NY; 845-454-9649, walkway.org) as Poughkeepsie’s answer to the High Line. The former railroad overpass is more than a mile long, making it the world’s longest elevated pedestrian bridge. 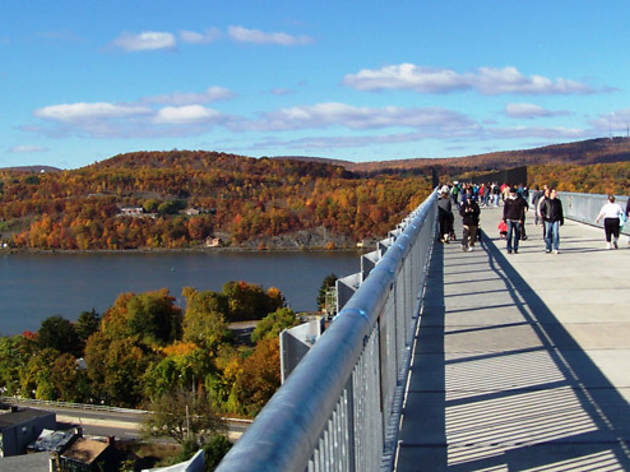 And smack dab in the middle—perched 212 feet above the Hudson River and surrounded by the Catskills—is where you’ll find a spectacular, 360-degree view of fall in all its colorful glory along the banks of the river. 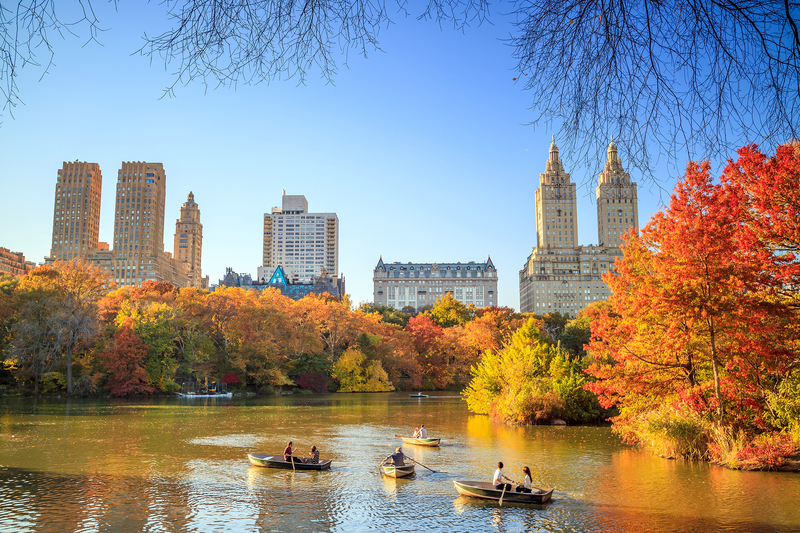 There’s no denying that the autumnal colors of Central Park have a lot of charm. 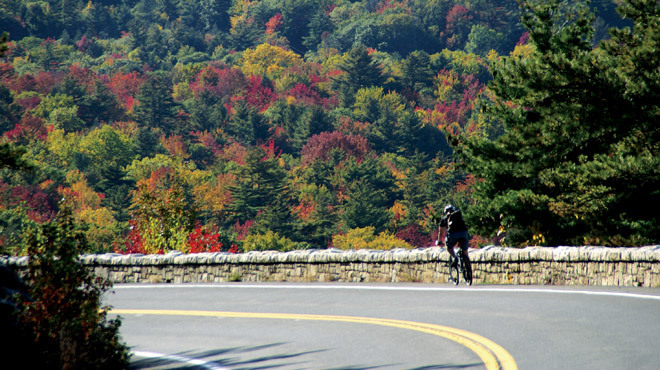 But 90 miles north of midtown, the Shawangunk Mountains Scenic Byway (mtnscenicbyway.org), an 88-mile loop between Kerhonkson and New Paltz, NY offers drive-by gawkers some of the state’s most picturesque views, with rustic farmlands and mountain vistas. The prime leaf-spotting happens as you ascend into the Shawangunk Mountains, which rise more than 2,000 feet above sea level. 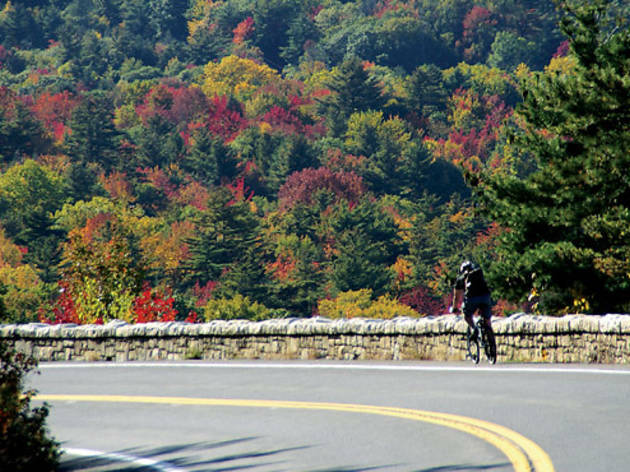 Along the way you’ll pass two back-to-back overlooks, each with imposing views of the Rondout Valley and the Catskill Mountains. If you feel the need to stretch your legs, pay a visit to the Minnewaska State Park Preserve (5281 Route 44-55, Kerhonkson, NY; 845-255-0752, nysparks.com), where you can walk, cycle, hike to a waterfall or rock climb. No car? No problem. 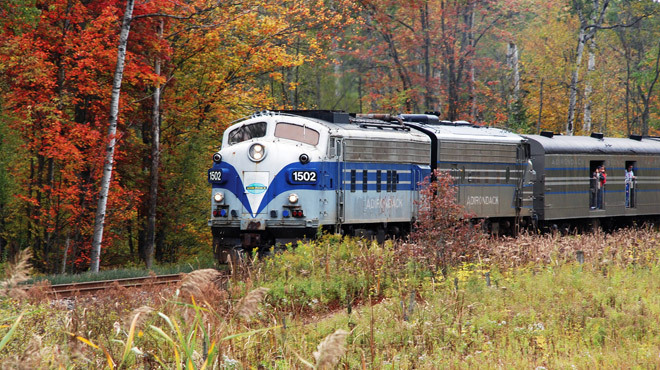 Pack a weekend bag and take a bucolic four-and-a-half hour ride from Penn Station to Utica, NY aboard Amtrak’s Empire Service (amtrak.com; $61–$234). Spend the night at the century-old Hotel Utica (102 Lafayette St between Washington and Seneca Sts, Utica, NY; 877-906-1912, hotelutica.com; nightly rates from $124), then head back to the station in the morning for another train ride, this time on the Adirondack Scenic Railroad’s Fall Foliage Train (adirondackrr.com; $29.50–$37.50).You’ll go past rivers and through the Adirondack foothills on this five-hour trek. 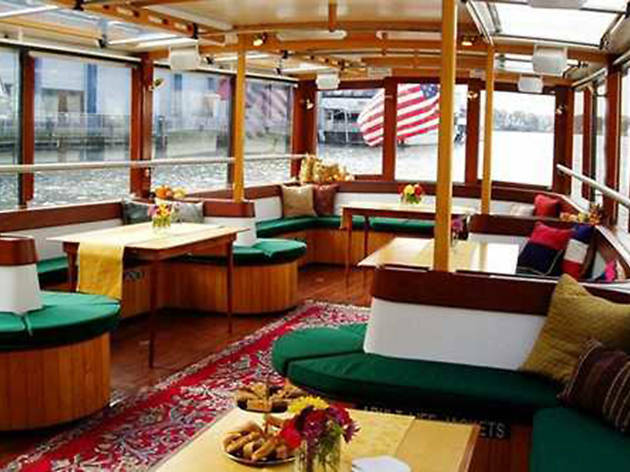 What better way to take in the beautiful autumn scenery than a cruise up the Hudson? Take advantage of the peak leaf season aboard a luxury yacht while you sip a mimosa or Bloody Mary, and enjoy a plentiful brunch spread. 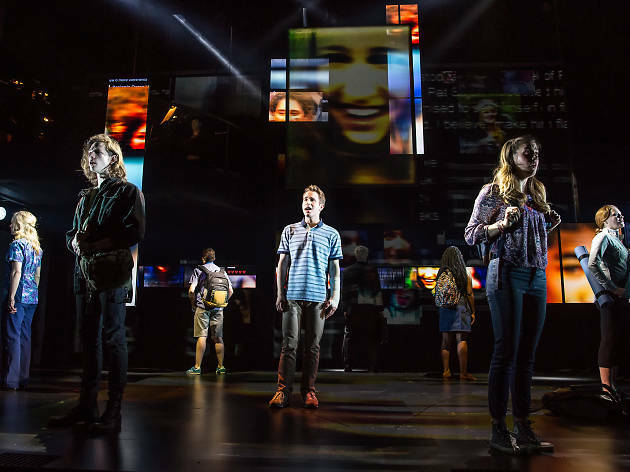 On this nearly three-hour adventure, you’ll observe New York’s natural wonders and the most vibrant foliage of the season. 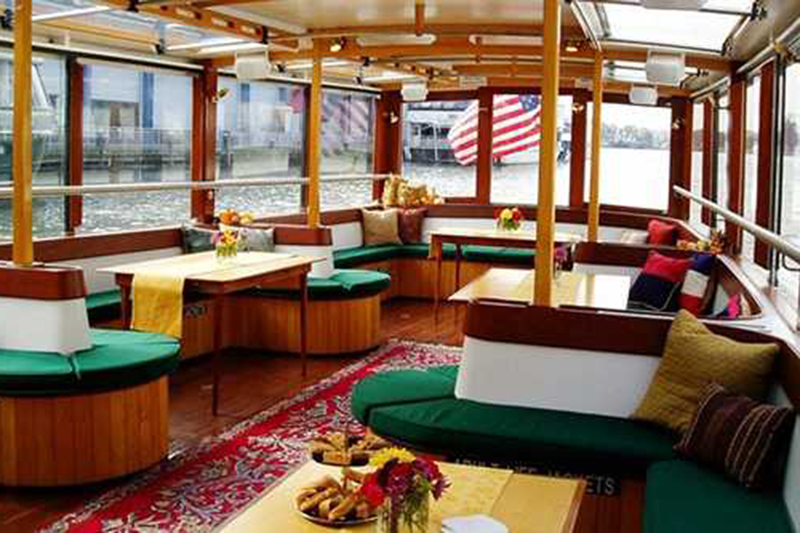 Don’t worry about the possible chill; the boats also have a heated, enclosed area from which to take in the sights. 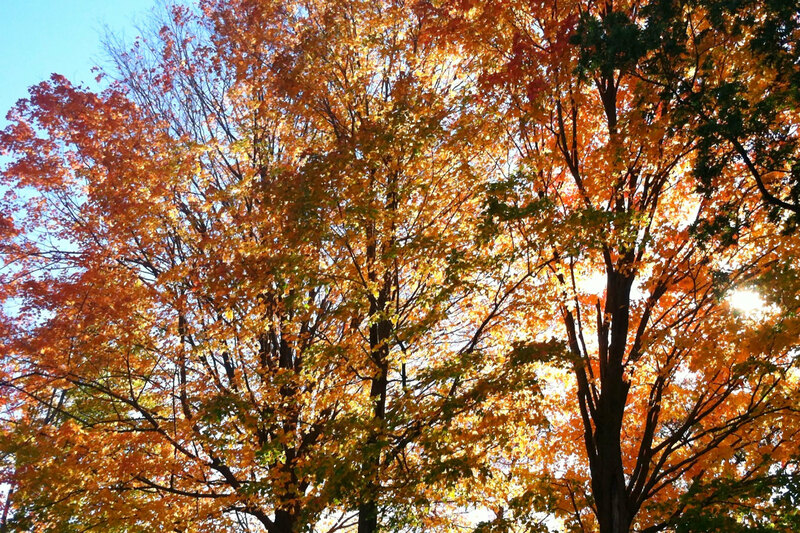 Wine, cheese and leaf peeping? Those are our three favorite things! 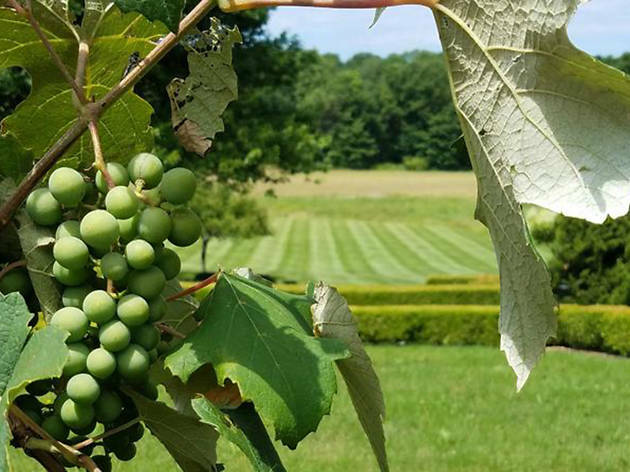 Enjoy stunning views of fall foliage and picturesque farms during this six-hour shuttled tour, where you’ll take a scenic trip to Hudson Valley, experience small town charm and sample vino and cheese from wineries in the region. A tasty picnic-style lunch is included. 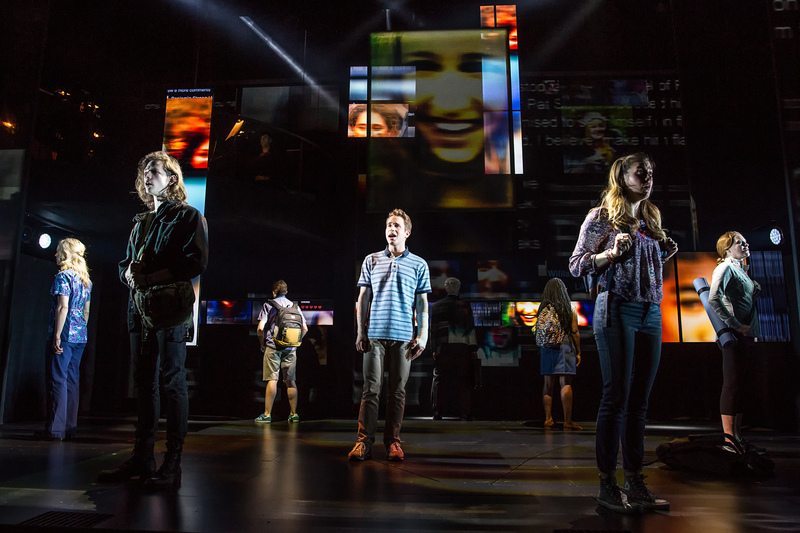 Want to check out a show?